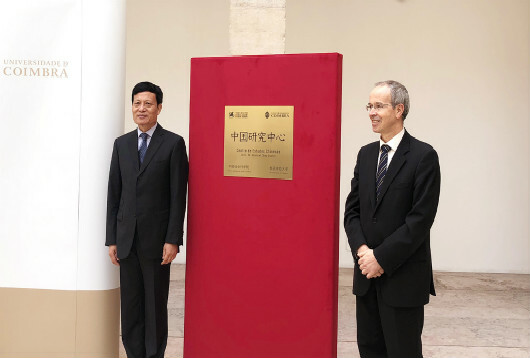 COIMBRA—The new China Research Center was unveiled at a seminar on the Silk Road at the University of Coimbra (UC) in Portugal on Dec. 4. China and Portugal started trading along the Maritime Silk Road as early as the beginning of the 16th century, making Portugal the first European country to interact with China through the Maritime Silk Road, said Xie Fuzhan, president of the Chinese Academy of Social Sciences (CASS). Spanning a long history, the ancient silk routes embody the spirit of peace and cooperation, openness and inclusiveness, mutual learning and mutual benefit, Xie said. In the 21st century, the spirit of the Silk Road is again shining bright. In 2013, Chinese President Xi Jinping proposed the Belt and Road (B&R) initiative, which aims to promote the common development of China and the rest of the world under the principles of consultation, contribution and shared benefits. In the past five years, this major initiative has been very popular and fruitful. Portugal is at the intersection of the Silk Road Economic Belt and the 21st-century Maritime Silk Road, making it a natural cooperative partner for the B&R initiative, Xie continued, asserting that the initiative will inject new impetus into the development of China-Portugal relations. Since ancient times, the Silk Road has been not only a road for trade and business, but also a channel for knowledge exchange. The China Research Center jointly set up by CASS and the UC will build an academic bridge for the two civilizations to learn from each other on the Silk Road of the new era, Xie said. By developing a deep and high-level exchange in the humanities and social sciences, the center will inject new vitality into China-Portugal friendship and new momentum into China-EU cooperation in the new era. Jo?o Gabriel Silva, rector of the UC, said that Portugal is a good friend and partner of China in the EU. In recent years, the two countries have witnessed frequent high-level exchanges and continuously strengthened cooperation in various fields. Economic, trade and investment cooperation has developed rapidly. China is Portugal’s largest trading partner in Asia, and Portugal is China’s fifth largest destination for investment in Europe, which stems from mutual trust. Silva also pointed out that China and Portugal have been in contact through the Maritime Silk Road since the 16th century. The shared benefits of trade development have deepened mutual understanding and trust. The UC has a large collection of valuable historical materials and literature on the early contact between China and Portugal, as the university has witnessed the humanities exchanges between the two countries for hundreds of years. The establishment of the China Research Center will open a new chapter in pragmatic cooperation between CASS and the UC, which is a milestone in promoting academic exchanges between China and Portugal, Silva said. The event coincides with Xi’s visit to Portugal. Xie and Silva signed the agreement on the establishment of the center under the witness of Xi and Portuguese Prime Minister António Costa on Dec. 5. According to the agreement, CASS will send outstanding scholars to the center for academic exchanges and lectures, and present academic publications on China studies to the center. The two sides will also hold academic seminars, carry out joint research and academic publishing, and focus on China-Portugal and China-Europe historical and cultural exchanges, joint construction of the B&R, China’s cooperation with Portuguese-speaking countries and other topics of common interest.